Diese nur aus dem Süden von Neuguinea und den Aru-Inseln stammende Art ist bereits seit 1880 bekannt. Der hier vorgestellte australische Aquarienstamm geht vermutlich auf Tiere zurück, die Ende der 1970er Jahre nach Australien importiert und danach durch Nachzucht erhalten wurden. Es ist nicht bekannt, aus welcher Region die ursprünglichen Tiere stammten. Es ist jedoch die farbigste der bislang bekannt gewordenen Formen von M. spl. rubrostriata. Besonders auffallend sind die über die ganze Körperfläche verbreiteten roten Streifen, wogegen bei den bekannte Wildformen diese Streifen nur partiell auftreten. Die dazwischen liegenden hellblau-metallisch glänzenden Schuppenreihen ergänzen das Bild und ergeben einen perfekten Fisch für große Aquarien. Das liegt daran, dass diese Form ohne weiteres 12-14 cm lang werden kann. Sehr schön ist die Kombination mit M. herbertaxelrodi oder Glossolepis multisquamata. This subspecies of M. splendida originates from the south of New Guinea and the Aru Islands. It is already known since 1880. The Australian aquarium strain presented here is likely to go back to specimens imported in the late 1970ies into Australia and subsequently kept by breeding. Nothing is known about the region where the specimen were imported from. But it is the most colourful of all known forms of M. spl. rubrostriata. This is in particular because of the red stripes which cover the whole body whereas this is only partial in the known wild forms. 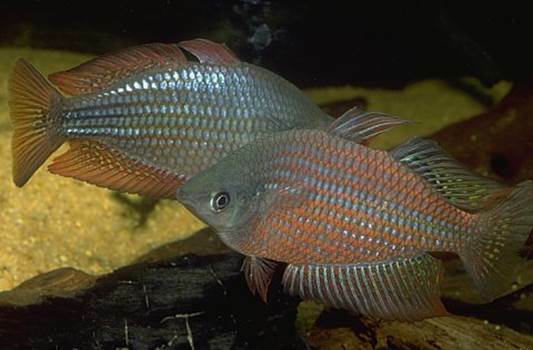 The metallic-blue scales between the red lines make up the whole picture and results in a perfect fish for large aquaria. This is because this form can reach 12-14 cm without problems. A very nice combination is with M. herbertaxelrodi or Glossolepis multisquamata.